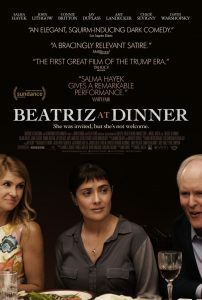 Beatriz at Dinner: Comedy, Tragedy, Portrait? We first see Beatriz (Salma Hayek) going through morning chores, feeding her dogs, and lighting a candle for deceased loved ones, including her dead goat. She’s in a rush to her work in a holistic healing firm. Her last patient of the day is a house call for a massage for Kathy, a wealthy woman in a gated community. After the house call, Beatriz’s car won’t start, so Kathy invites her to stay for the small dinner party she’s hosting for her husband’s business associates. It’s the stuff of comedy, a movie you’ve all seen before: The wealthy matron invites an employee to an important dinner party she’s hosting for even wealthier associates. We have rollicking fun watching the crude manners of the outsider exposing the pomposity of the wealthy. At the end, everybody realizes that the simple ways of the poor employee are superior to the smug frivolity of the privileged. Everybody is happy. Everybody learns something. Spoiler alert: They didn’t go that way. Beatriz is aware of the awkwardness of the situation, but not in the least cowed by it. She greats each guest with a hug, somewhat to their surprise. Her adversary is the tycoon Doug Strutt (John Lithgow). He’s not a sympathetic character, but also not the stereotypical bully. He’s interested in Beatriz, though not as a human being, but in the way one might be curious about an exotic animal. She thinks he might be the tycoon whose failed hotel ruined her village. Thus ensues the evening’s debate between two people who have absolute confidence in themselves and absolutely no respect for each other. She’s angry with him; he’s dismissive of her. We watch, waiting for someone to bend, someone to land a blow. Both Hayek and Lithgow give admirable performances, and the supporting cast, well, supports, though there is little to challenge them, sitting off-center with these two giants. Some listings call this movie a comedy, which surprised me. Others call it a drama. I think of it as a tragedy. Perhaps it’s not clear what literary term to use because this film is less a play than it is a picture, a stark, vivid flat canvas depiction of polar opposites, an illustration of the division in the U.S. today.